Our friends Nick and Marketa have asked us to join them on a Friday night at an Indonesian joint they’re keen on. After long weeks of work and school, we’re not exactly bursting with enthusiasm as we hit the road, anticipating – and finding – a handful of bottlenecks along the way from Yarraville to Brunswick. But make the trek we do. And end up being oh-so-glad we’ve done so. The Uleg is the bomb. It serves the best Indonesian food I’ve ever had. Now, that may not be saying all that much at all. But … the food here has high levels of homemade personality and soul, downhome refinement and distinctiveness I’ve never before encountered in an Indonesian eatery – and that we rarely encounter in eateries of any Asian persuasion. It earns the top-shelf Consider The Sauce accolade – we wish it was in the west! 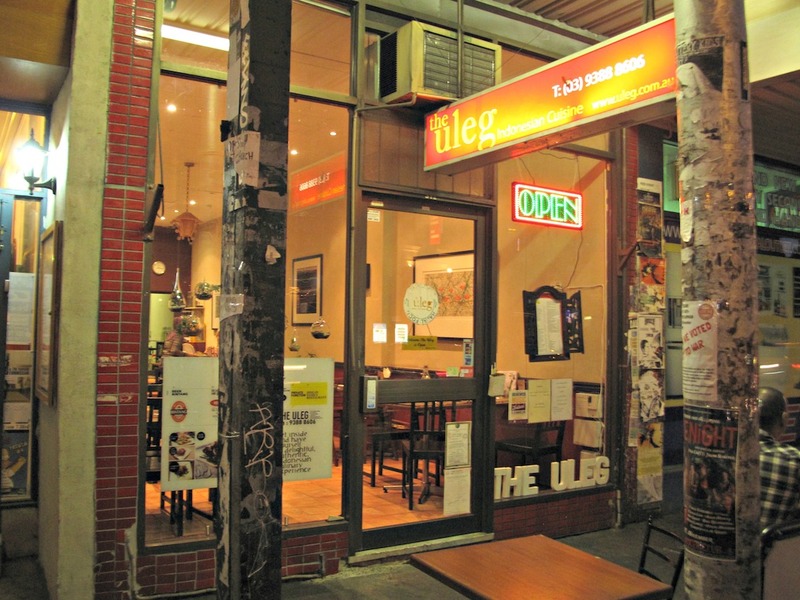 The Uleg is located on a portion of Sydney Road that is these days heavily hipsterised, though as with almost the entire length of the road there are many good and/or interesting eating options around. Uleg’s longish dining room is lovely in wood and has the feel of a place that has been around for a while. The service we find to be as warm and personable as the food. 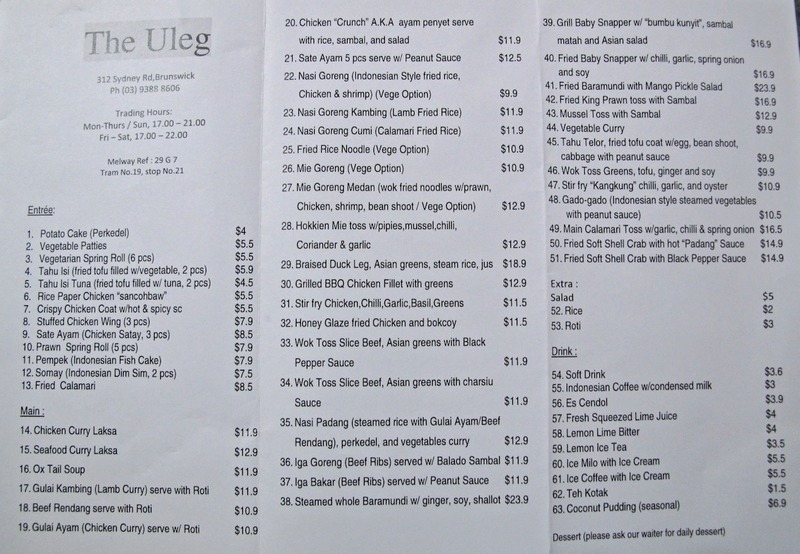 The menu (see below) has about a dozen entrees in the $4 to $9 range. Mains number about 50 and average about $13. Save for a handful of snapper and barramundi dishes for around $17 and $24 respectively, they’re all configured as single-person dishes though that doesn’t deter all of us from tasting everything on our table. Our entrees turn up smartly. But it’s true that our four mains arrive in a procession with up to about five minutes between them. I’m led to believe there’s minimal staff in the kitchen and, besides, the wait times are no problem whatsoever considering the quality of the food. Well, no, not really – though I know what Marketa means. The serves aren’t food-court, cheap-eats ginormous – but they’re more than adequate. But that quality’s the thing, right down to the hand-made condiments. Besides, we order freely, eat very well and end up paying a most excellent fee of about $25 each. 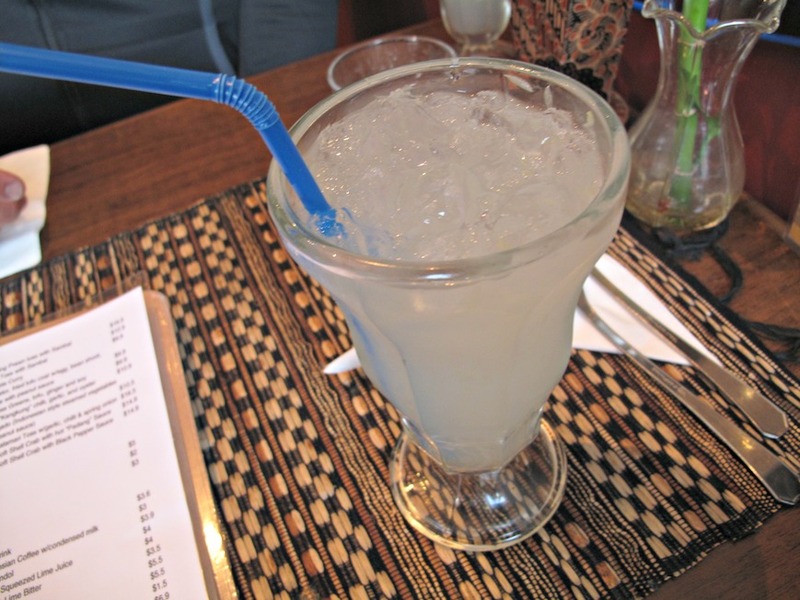 First up – freshly squeezed lime juice over ice ($4). Bennie and I do two of these apiece. There’s probably enough sugar involved to rival the canned soft drinks we habitually slurp with spicy food but this stuff nevertheless rocks our world as a tart, lip-smacking alternative. 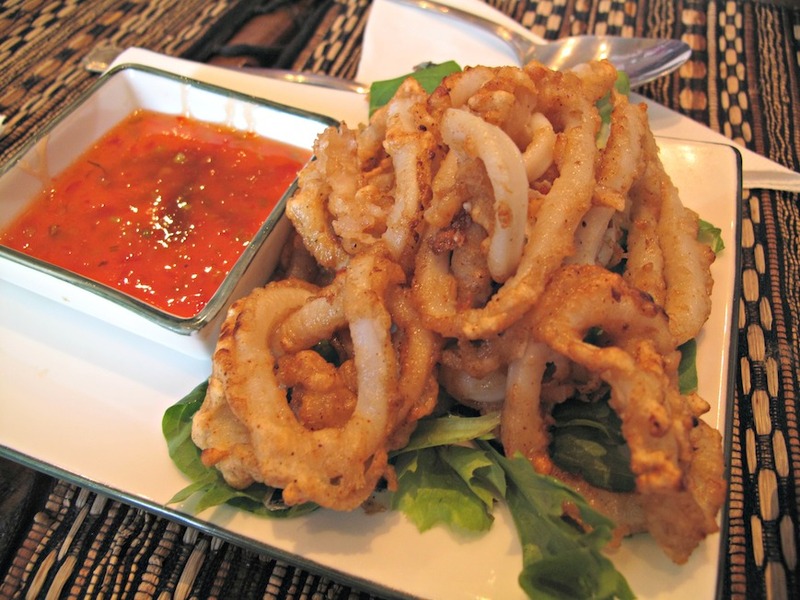 Fried calamari is the most expensive entree at $8.50. It’s fresh, tender, very lightly battered and good without being spectacular. 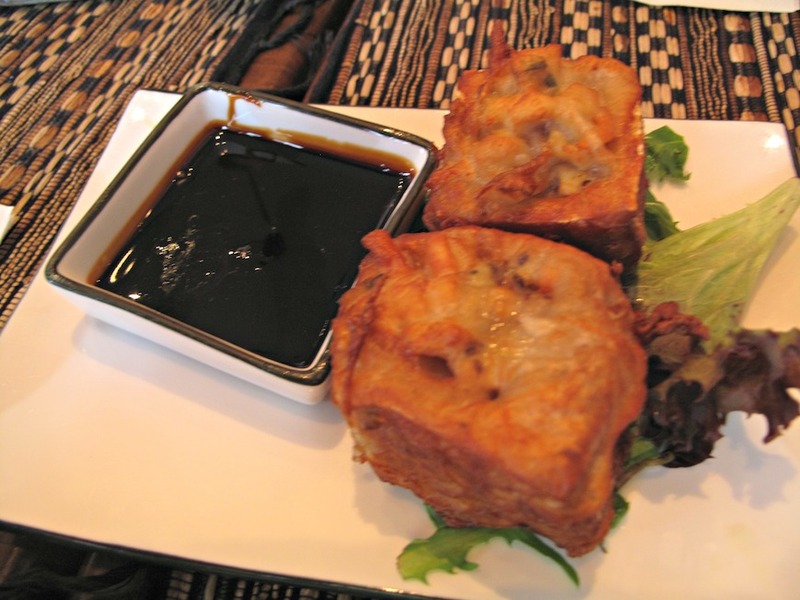 Tahu isi ($5.90) is two very enjoyable big cubes of fried tofu stuffed with beans sprouts, carrot and so on, and served with a very sticky soy sauce. 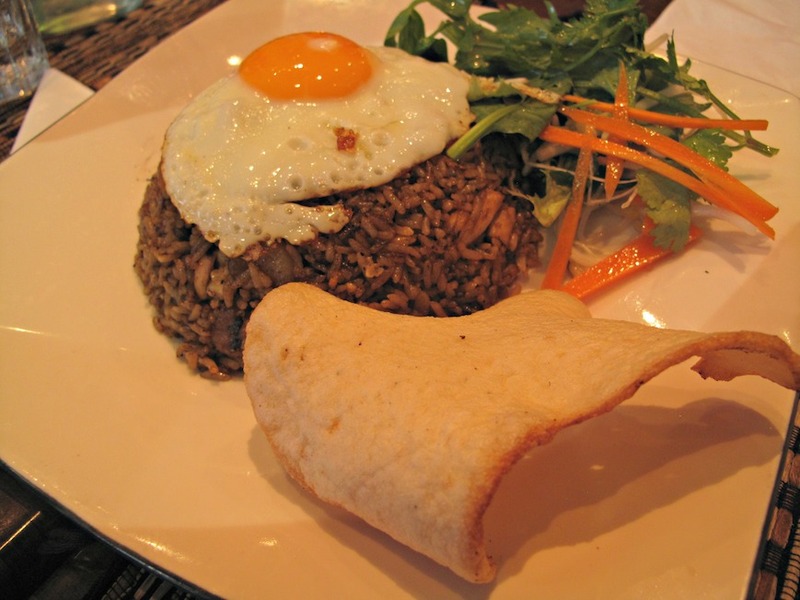 Nasi goreng ($9.90) we share. It’s excellent, with fine wok-charred flavour and good-size chunks of chicken. 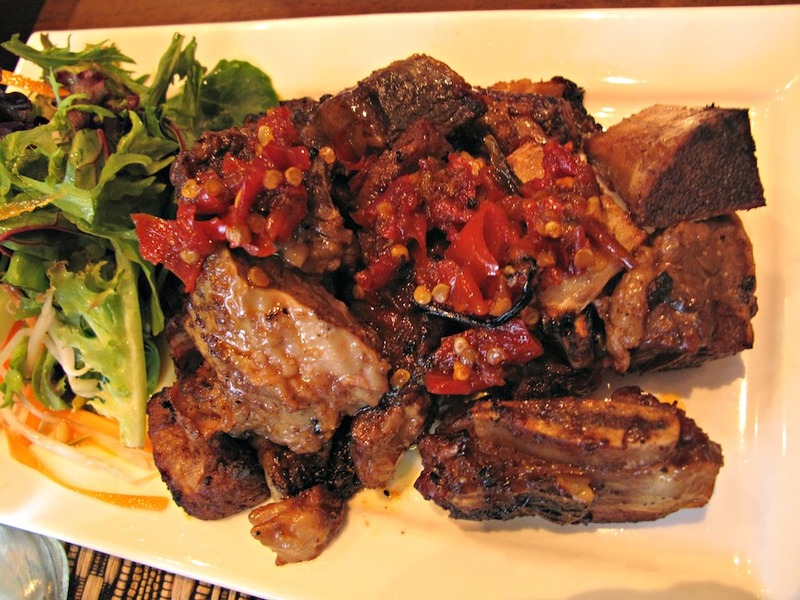 Iga goreng ($11.90, top photograph) is beef ribs served with Balado sambal. The meat is tender and comes from the bones easily; there’s fat but it’s easily discarded. The flavour-packed meat harmonises beaut with the chilli mash. Chicken “Crunch” A.K.A ayam penyet ($11.90) is good, too, though it turns out to be the most mundane of our dishes so stiff is the compeition it faces. The chook maryland is fine enough and is adorned with fried garlic flakes. 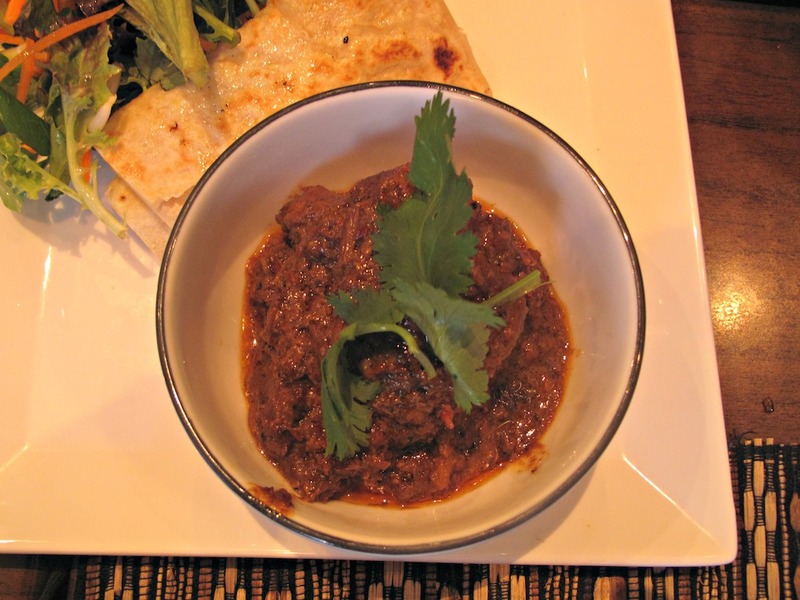 Beef rendang with roti ($10.90) is another trumph. We often find restaurant rendang to be OK but dull. This one is not like that – it sings with hand-mixed spices and deft cooking. 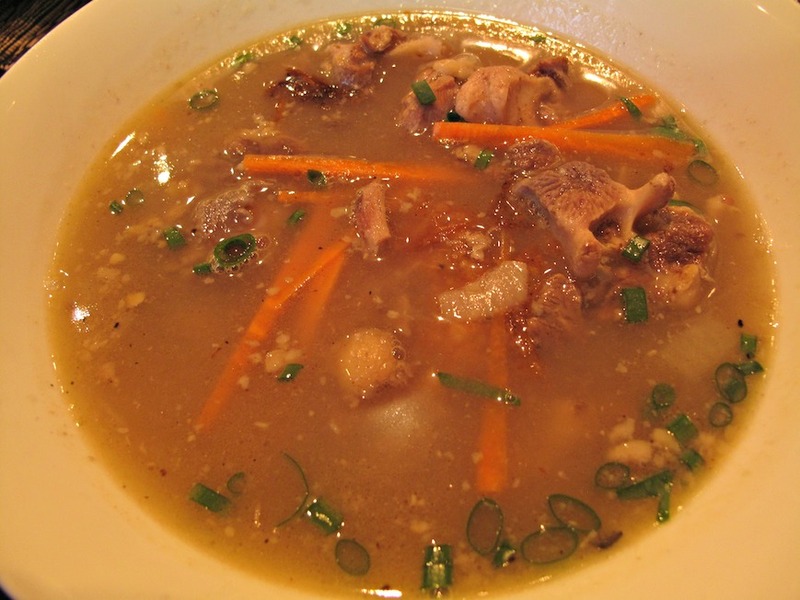 Finally, ox tail soup ($11.90) – bit of an odd man out that nevertheless fits just with our other selections. It’s bigger than it photographs. It’s salty in a good way. It’s like a cross between two Vietnamese dishes – beef pho and on-the-bone beef stew. Just without the star anise. It has a heap of fat but also a heap of fall-apart-tender meat. And submerged in there is a plump, deep-fried “potato cake” – no, most definitely not your typical Aussie F&C shop potato cake. This one has spud cubes encased in a rich batter, the whole flavoursome and disintegrating at just the right pace as the soup eating progresses. Hi Kenny! 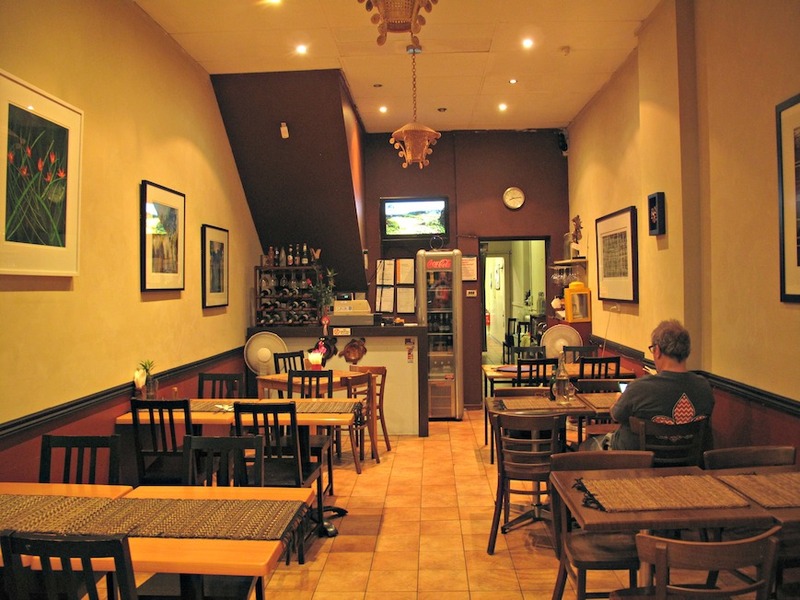 Have you tried Warung Agus in Victoria St, West Melbourne? Balinese, not Indonesian as such, but pretty special. Hi James! Thanks for the tip! Could just about qualify as western suburbs, too! I’ve never made it to Warung Agus but have heard a number of reports that the food there is top-notch 🙂 The food is Balinese cuisine but that’s not to say it’s not “Indonesian” food as there is really no blanket term that covers all that country’s food. 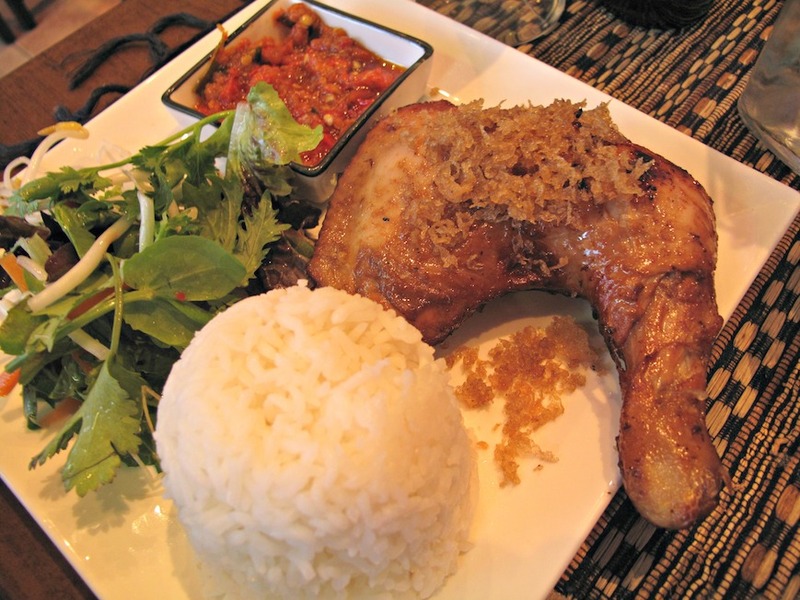 “Indonesian” food is like the archipelago itself, a melange of dozens of cultures and cuisine. There is lots of cross-pollination between cuisines and dishes. Some dishes are specific to certain areas (or originated there), such as rendang which comes from West Sumatra, babi guling (suckling pig) from Bali, or nasi rawon (another soup you should try Kenny!) which originates from east Java. Some dishes are ubiquitous and widespread with subtle regional variations – nasi goreng, satay (many, many different meats and sauces used from end to end of the island chain), soto ayam (chicken noodle soup), ayam bakar (grilled chicken)… etc. The Uleg is warmly recommended to you! Wow, didn’t know Garage was even still around. Used to eat there years ago. Definitely good food.